Is Kevin Hart's comedy a little short? 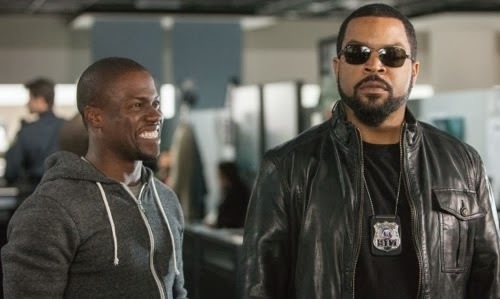 The new movie Ride Along has Kevin Hart and Ice Cube paired up in a comedy action film. Now the advertising for this movie has been insane. Any social media site or popular TV show has advertised this movie one way or another, which is great to get people to see it. The only problem is, that you will have already seen all of the funny parts in the movie. Yep, this is a classic case of all the comedy is in the trailer and there will be only 2 scenes in the movie that's funny because you didn't see it yet. Kevin Hart is the big thing in comedy right now. After releasing his stand up special, and having 3 more movies to be released later this year. He is someone you will want to put in a movie. Kevin Hart is the hot thing in comedy. Now Universal did distribute the movie, but Cube Vision Productions was one of the studio productions, meaning Ice Cube was a producer of this movie. Now I would have thought that if Ice Cube produced it that is where all of the stunt ideas came from. 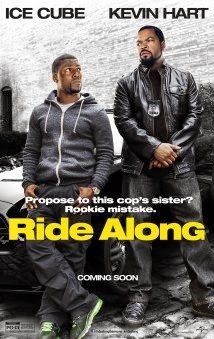 He added all of the action in the movie while Kevin Hart added the comedy. Of course you will end up seeing this movie in theaters because everyone else is watching it and it is being promoted like no tomorrow. If you do end up going, try to pretend you never saw a trailer for the movie and watch closely for those 2 parts in the movie that were really funny because they were not showed in the movie. Universal is already in talks to make a sequel to this movie. Comment below on what you think. Should a sequel be made, or is this movie done. The movie trailer needed to be different. They could have just showed Kevin Hart and Ice Cube and had a slogan like B.A. Cop meets Rent-A-Cop. That would have been enough to get everyone to the theater. Also if they added more comedy they could have lengthen the movie more. If it was pee your pants funny, people wouldn't mind sitting and watching more of a movie.